THIS CONDO IS SIMPLY ONE OF THE BEST IN THIS METICULOUSLY MAINTAINED DEVELOPMENT. Updated unit which includes kitchen, appliances, cabinets, granite counter tops and bath with new cabinets, shower and granite countertops. Our home away from home is located on the third floor, and has an expansive ocean view from the living room and lanai. Our unit is classified as an 'A' unit which represents the best in quality and one of the most desirable in the complex. Our unit overlooks a gorgeous Koi pond as well as finely manicured tropical landscaping and pool area. 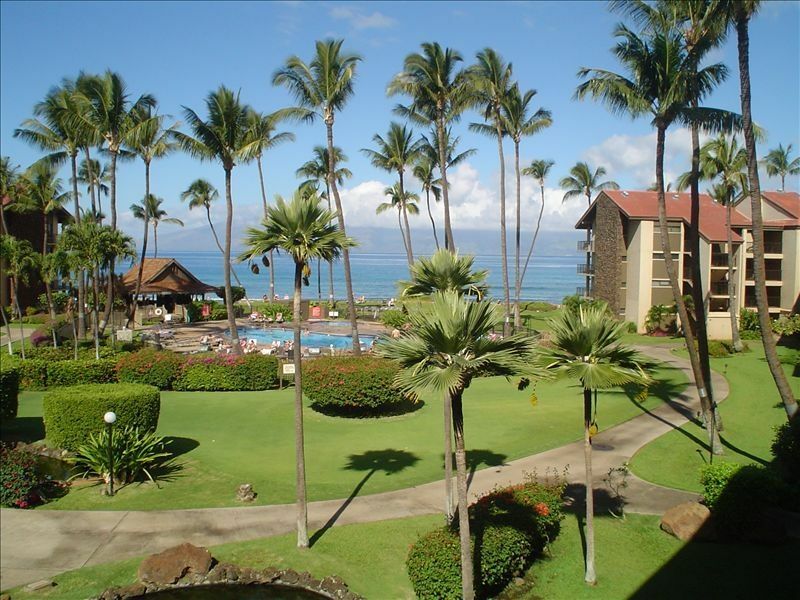 Our condo is located in the Papakea Resort, and is located at 3543 Lower Honoapiilani Road, Maui, Hawaii. Our unit comfortably sleeps four with king-size bed in the bedroom, and queen-size sofa bed in the living room. We also feature air conditioning, ceiling fans in living room and bedroom, hair dryer and a washer and dryer in the unit, for your comfort. Our condo is situated in an oceanfront complex, which sits on thirteen acres of tropical landscape, accented by freshwater ponds and expansive lawns. It is great for families or a quaint getaway. Being located in Maui's popular Kaanapali area, near championship golf courses, a wonderful farmer's market (for fresh local fruit and produce), shopping and dining, makes this a 'high demand' vacation spot. The complex features a 24-hour manned lobby, concierge service for booking your outings, elevators for every building, luggage carts, two newly remodeled pool areas, with a Lanais at each location, along with twelve gas barbeques and patio furniture for your dining pleasure (six at each pool), two Jacuzzis, two 12-hole putting greens, with putter rentals at front desk (for a nominal fee), three lighted tennis courts and two shuffleboards. Papakea also features water aerobics and yoga classes, as well as a great putting contest throughout the week (see schedule at check-in). We are only a five minute drive from world renowned Lahaina Town, where you will find the best in restaurants, shopping, and nightlife. The piers in Lahaina town are also the launching pad for ocean outings including deep sea fishing, whale watching tours, snorkeling cruises, and sunset sailing adventures. There is so much more near by including the upscale Whaler’s Village shopping center, which features upscale shopping and dining as well as the casual souvenir shopping, and it's located right on the beach. Speaking of Beaches, Maui is world famous for its beaches, and you will find that you can trek from the beach in front of our unit endlessly along the coastline. We have an activity director in our lobby, which can assist you in booking endless fun, including: luaus, whale watching tours, sailing, horseback riding, snorkeling, golf, biking down a volcano, wine tasting, fishing, jet skiing, windsurfing, surf lessons, etc. 24 hour manned lobby, concierge service for booking outings, two pools, two Jacuzzis, two putting greens, twelve gas barbeques, three lit tennis courts, two shuffleboard, water aerobics and yoga classes. The great unit for our stay. Papakea is a fine, fun, and relaxing resort that we highly recommend for your stay. We stayed in this unit for two weeks and had absolutely no issues with it. It was clean and stocked with all that we required. The view from the lanai is just beautiful! Our annual Maui vacation was really great and this unit contributed to making it so. We will again stay in this unit if available during our future trips to Maui. Aloha & Mahalo. We loved the property. It is a beautiful location. The condo was clean and very comfortable. It could use a little updating. Overall nice place. Sofa and recliner needs cleaning or replacing. Housekeeping service needs to be more reliable as the unit was not cleaned when we arrived. No fault of the owners. I am surprised to hear the sofa needs cleaning or replacing as it is brand new. Did it look like something had been spilled perhaps? We will look into it and thank you for making us aware of it. The condo was decorated beautifully and the bed was heaven after a day of exploring this stunning island! Spent two weeks at Papakea, love the resort, our 2nd time staying at Papakea and the first in this unit. Clean and well equipped with all you need, the view from the lanai is beautiful - would definitely stay here again!